A stylish and stable board designed both for amateur and professional paddlers. 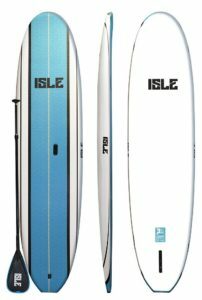 The Isle Soft Paddle Board is a practical choice for all paddlers. Its durability enables it to support riders who weigh from 189 to 358 lbs., a remarkable attribute for a lightweight board. Although lightweight, it remains to be rigid and stable even for small surfs. Its wooden design does not only make you ride in style, but also offers you smooth rides on flat water. 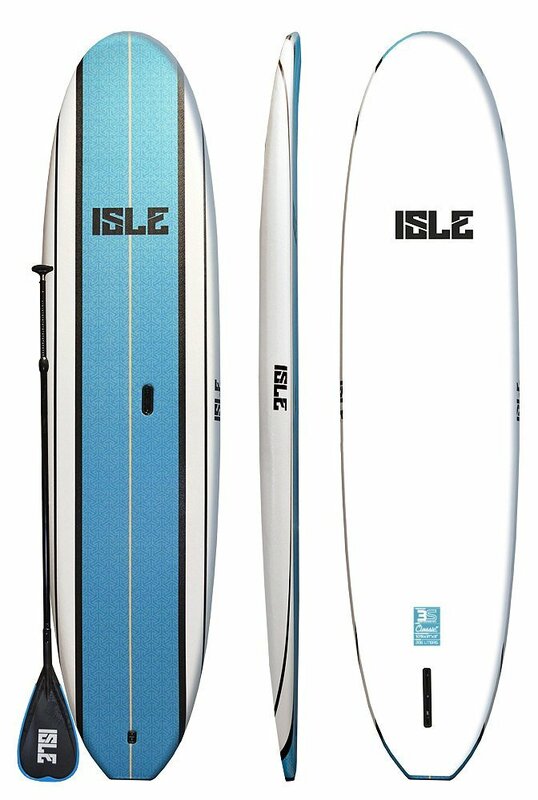 The Isle gives you another exceptional board that can help beginners to learn how to paddle easily and also delivers versatility for riders with higher and more advanced skills levels. This is definitely one of the best and most practical choices for stand up paddle boards. One of the best features of this model is its flexibility to support paddlers of various skills levels. Even novice paddlers can glide through flat water easily with no hesitation. This is a something that you can rely on as you get better with paddle boarding. It serves you from your humble beginnings and lasts you until you’re already able to ride through small surfs. It’s highly economical as people would usually spend on different boards depending on the level of their skills. Another great feature that leaves customers very impressed is its non-slip surface. It holds a patent for an efficient water-resistant soft skin that makes riding carefree and not to mention, safer, especially for beginners and bigger riders. This Isle Soft Serve comes with an embedded triple stringer. This gives the stability and rigidity that we all look for in a paddle board. It is very easy to manage, being only 31 inches wide and 27 pounds light. Running towards the water would definitely more exciting with a paddle board that you can manage to carry on your own. You can set it apart easily from the traditional epoxy paddle board. It is more buoyant and more practical in terms of features, performance, and cost. 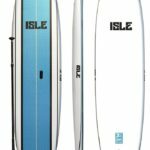 With the goal of giving its customers the best paddle board, The Isle offers a stand up paddle board that caters to diverse markets. Although a foam board, it can match the performance of the traditional epoxy paddle board. Its soft top is manufactured with embedded triple stringers with built-in grip providing more rigidity and hold. Its hard bottom that is made of plastic allows for smooth rides both in flat water and small surfs. The materials used provide comfort and protection for the rider, but without compromising the intensity of the rides. The Isle’s wooden design never fails to impress riders and watchers. It is sleek, classy, and versatile. It may appear fragile, but its finish keeps it safe from all kinds of scratches, cracks, and scrapes from rocks and sand. The paddle board comes with a sturdy alloy plastic paddle that you can easily adjust. The package is complete with an easy lift carry handle, center box fin, and a surf leash. The only problem said about the product is in its assembly. Sometimes, it can be hard to get the fin in, but you can still work around it. It’s the ultimate choice for newbies and pros who want a paddle board for a reasonable price. What’s the Best Stand-up Paddle Board for Ocean Paddling? Sounds like the Isle Soft Serve is the perfect paddleboard to get as a first board. It’s features are great for beginners and for those who want to commit to the sport. An awesome all-around board.